The University of Queensland completed the first multi-centre randomised controlled blind study of cervicogenic headache published in 2002. Physiotherapy treatment (joint mobilisations, specific muscle re-education exercises and spinal soft tissue mobilising techniques) was found to significantly improve symptoms in recognised cervicogenic headache sufferers, and was significantly more effective than medical management. 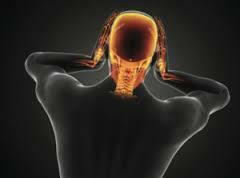 It is suspected that over 30% of headaches are cervicogenic in origin, and physiotherapists are well placed to determine whether the cervical spine is playing any part in the production of headache symptoms. Unilateral pain without side shift (within that episode & typically between) NOTE: Can also be bilateral if bilateral trauma and/or degenerative changes. The upper 3 (C1-3) cervical levels are most commonly involved in cervicogenic headaches. It is important to point out that many headache sufferers may suffer multi-source headaches. For example, a Migraine sufferer may simultaneously experience a Tension Type Headache and Neck Headache. Treatment varies depending in the symptoms and headache source. Physiotherapy treatment will include joint mobilizations and/or manipulations to the upper cervical spine, specific retraining of the deep neck flexors (upper cervical spine stabilizing muscles), stretching tight muscles in the upper quadrant, postural correction exercises (thoracic spine extension range, lower trapezius muscle strength, head on neck position), neural mobilizations, and patient education. The physiotherapist may also use dry needling techniques and will give the patient home exercises to assist with management and decrease recurrence. Contact any of our Move Well Physio clinics for assistance or further information.